Recent retreats have added greatly to my UFO pile. I have to get busy quilting some of these so I can get them off the list. 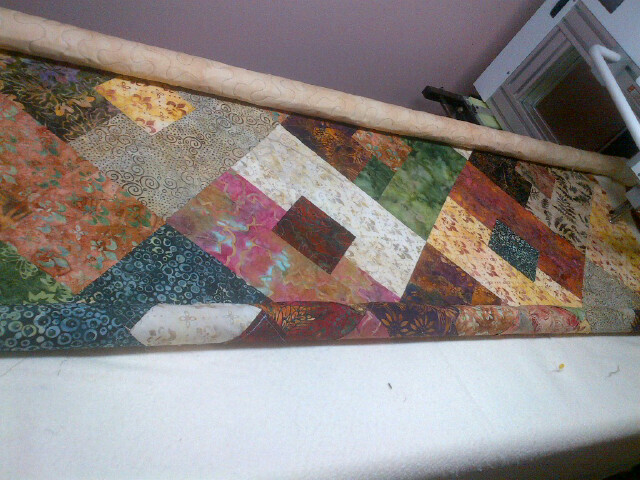 I loaded up Shannon's Fleur De Lis quilt yesterday and got it started. It is turning out very nice, but I don't have very much stamina. My back keeps telling me to stop. I hope to have it done before the meeting so I can bring it for Show and Tell. Our Paint Chip Challenge is wrapping up this week at the guild meeting and I'll certainly be glad to have that off my plate. I didn't mind so much participating in it, but I did not really like being in charge of it. People ask you how you want to handle the voting and the hanging and all that. And when you answer them, then they start to tell you how they think you ought to do it. At this point, I just plain don't care. I just want it over with. Have you ever been in that situation? I hope my friend Sarah has recovered from the ordeal of organizing her quilt stuff. I haven't heard from her yet. I sure hope she's happy with how things turned out. I envy her the great sewing room that she has along with all that great sewing furniture and multiple sewing machines, etc. She has a great setup. I have another friend (Glen) who got to go on a 4 day retreat. What a joy! I would have loved to have been able to join her, but work keeps getting in the way. Maybe next time. I know exactly what you mean! As the mystery chair I set things up and they chane it anyway! They wanted a short pattern so I knocked myself out finding an 8 month pattern and they set up the end for nove,bet anyway.......go figure. Aughhhh! I have learned to just let it go! glen : and go on lots of retreats!